After selling out the Q-Factory without announcing a single act, Oliver Heldensis now revealing who will be joining him on the bill for his annual Heldeep event during Amsterdam Dance Event. Divided over two rooms, more than 10 acts will be performing, including the legendary Moguai and Tommie Sunshine, upcoming acts Aevion and Loud Luxury as well as Mike Cervello, Mr. Belt & Wezol, Zonderling and many more. The large list of artists are all associated with Oliver Heldens and the Heldeep label in one way or another, from forthcoming collaborators like Mike Cervello to artists that have remixed or were remixed for the label, like Moguai and Tommie Sunshine. 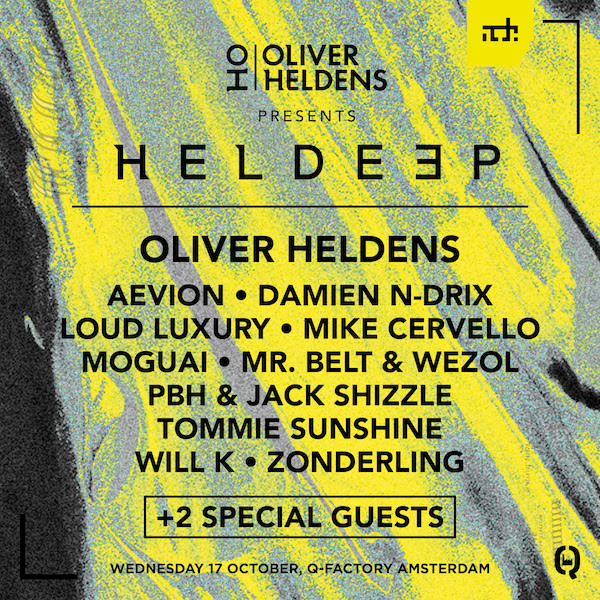 Oliver Heldens has been ever-present at Amsterdam Dance Event with his Heldeep events, selling out year after year at some of Amsterdam’s most iconic venues, most notably Paradiso for two years. This time around Heldens has sold out the Q-Factory, a brand new 1000+ capacity venue in the Eastern part of the city.